The list begins with Napoleon: A Life, the best book I read in 2014, and certainly the most impressive literary achievement among all the books listed. Runner-up is A Misplaced Massacre, a mesmerizing example of creative non-fiction. The final eight are listed in chronological order of subject matter, from ancient to modern. 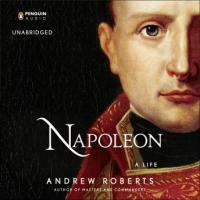 *NAPOLEON: A LIFE by Andrew Roberts: My library contains some 250 books on the French Revolutionary and Napoleonic eras. I thought I’d read virtually everything worth knowing, but I devoured this sympathetic and yet eyes-wide-open biography. Across 800 pages, Roberts weaves the Corsican’s personal and public lives into a coherent whole, no small achievement considering the subject was a giant who towered over a continent for two decades. Roberts’ Napoleon is fresh from the get-go, as he presents the boy as voracious reader, soaking up the adventures of Alexander and Caesar. Drawing on Napoleon’s newly published complete letters (tens of thousands of them), Roberts describes an indefatigable ruler who out-Caesared Julius. Even in the midst of his most difficult military campaigns, the imperial Napoleon bombarded his bureaucrats back home with mountains of correspondence on topics ranging from French theatrical productions to the untimely death in a traffic accident of a small boy he never knew. Napoleon the passionate lover, cuckolded spouse, and collector of mistresses also gets his due in Roberts’s book. The author’s admiration for Napoleon as military commander, enduring lawgiver, and effective administrator comes through, but he never fails to identify the blind spots and cascading mistakes that turned Europe’s foremost realist into the tragic captive of St. Helena. The book is by turns encyclopedic and novelistic. “Napoleon” is filled with riveting passages, such as the impact of typhus on the Russian campaign or the Emperor’s dramatic return from Elba to reclaim his throne. Few lives compare with Napoleon’s for adventure, tragedy and legacy: perhaps only those of Alexander, Caesar, Joan of Arc, and Lincoln. No single-volume biography of Napoleon I’ve seen compares with this one for insight and completeness. *A MISPLACED MASSACRE: Struggling Over the Memory of Sand Creek, by Ari Kelman: A compelling and factually reliable account of the long and very contentious road traveled by the National Park Service, Colorado historians, local landowners, and, perhaps most determinedly of all, representatives of the Northern and Southern Cheyenne and Arapaho tribes, to identify and settle for all time the true location of the (“misplaced”) Sand Creek Massacre site. Kelman manages to turn an irresolvable dispute of modern historical and archeological methodology versus traditional tribal lore and oral tradition into a dramatic narrative. Characters are vividly portrayed, warts and all, but always with sympathy. *THROUGH THE PERILOUS FIGHT: From the Burning of Washington to the Star-Spangled Banner: The Six Weeks That Saved the Nation by Steve Vogel: This is history as it should be told: immediate, engaging, filled with realistic characters and vividly presented events. *WYOMING RANGE WAR: The Infamous Invasion of Johnson County, by John W. Davis: The best book on Gilded Age greed gone Wild West. *TOM HORN IN LIFE AND LEGEND by Larry D. Ball: A deeply researched and well written bio of this fascinating cowboy, miner, mule packer, chief of Indian scouts, Pinkerton detective, feudist, and hired assassin. *YOUNG TITAN by Michael Shelden: The story of how exuberant youthfulness and “glamorous charm” brought Winston Churchill nearly to the pinnacle of power, to be replaced after his fall in 1915 by “the cumulative force of a character that had been tested and strengthened over time.” Always a “dangerous optimist,” he believed in himself, and came back when no one else thought it possible, just in time to stop Hitler. *CATASTROPHE 1914: Europe Goes to War, by Max Hastings: Perhaps the finest synthesis of eloquent, first-hand accounts I’ve ever read in a military history. Includes views of the politicians, diplomats, and generals who started the war and “led” its downward spiral to catastrophe, transitioning into the emphasized “testimony of humble folk – soldiers, sailors, civilians (men, women and children) — who became its victims,” all explained with spot-on perceptive analysis. *THE CHURCHILL FACTOR: How One Man Made History by Boris Johnson: The current Mayor of London, like Churchill a journalist, historian, and rogue elephant of a Tory politician, has produced a wonderfully chatty book on Sir Winston Churchill. An illuminating study of what it was that made Churchill the only man who could have saved democracy and its benefits for all peoples in 1940. And did.